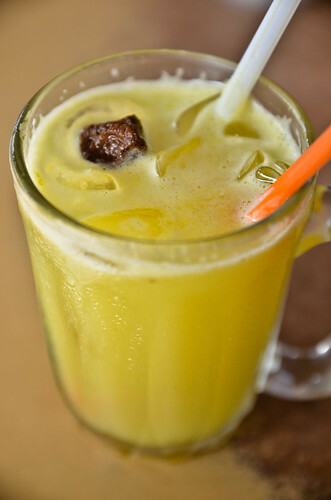 1) Leong Soi – This hideous witches-brew-looking drink was my first request when I went to visit my auntie during my trip. 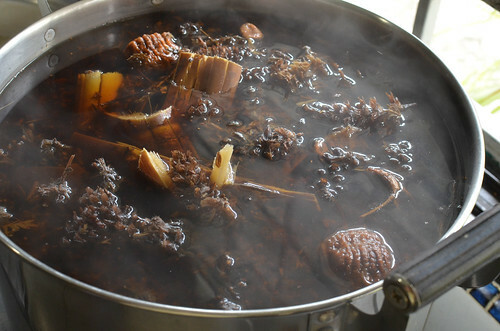 My grandmother used to boil this drink consisting of various dried leaves and stems that produce a slightly bitter dark herbal drink that I would sip often when it was too hot or when my system was overtaxed by the rich food. Grandma was well-versed in Chinese herbal medicine since she had to rely on such cures during times when visiting doctors were financially unfeasible during the meager war years. I am glad my auntie boiled this large pot since I must have consumed most of this in just a mere two days! I did indeed feel much better after. 2) Yeen Mai Soi/Barley Drink – Another favorite of mine is this drink made by boiling whole barley pearls until most of the starch has leached into the liquid, leaving a slightly thick drink. Sugar is added to sweeten it and lime juice to lighten it. Served with ice, it is the perfect order when visiting a coffeeshop as in this case, the reputable Lai Fong Coffeeshop near Petaling Street, Kuala Lumpur. It may appear quite heavy due to the starch but amazingly it does a wonderful job cooling the system especially when served with lots of ice. 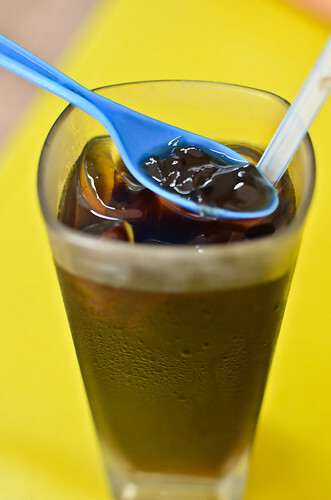 3) Leong Fun/Grass Jelly Drink – This dark drink is another coffeeshop favorite that consists of a jelly made from Grass Jelly and mixed with a slightly sweetened iced water. The jelly is made by boiling slightly oxidized stems and leaves of a plant, member of the mint family, along with a coagulant, and then allowed to cool into a jelly form. It is slightly bitter and herbal which is balanced by the sugary water. It can be found in most coffeeshops and it is another must order when dealing with the tropical heat. 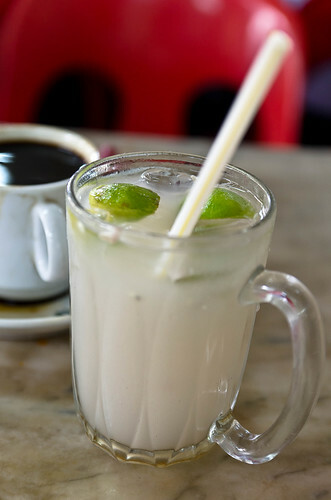 4) Sheen Kam Soi/Lime Drink – This rather potent drink is made with lots of lime juice as well as Vitamin C. It is made with the local Kalamansi lime which is small yet packs a punch in its juices but not too sour as Key limes, the one used to make Key lime pies. It has a slight bitterness from its tough skin that balances the tart flavors. To enhance the flavors, a dried salted plum is added as the piece de resistance and the ultimate sour and salty treat in this drink. 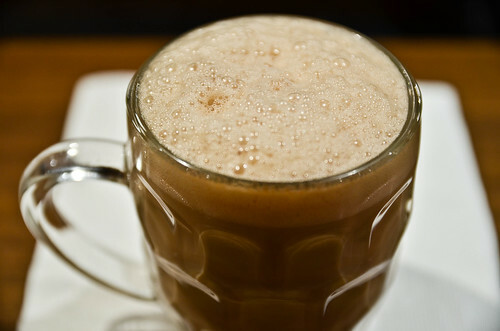 5) Teh Tarik/Pulled Tea – This drink hails from the South Indian community that used to be served at Roti Canai stalls (see blog) along with its food offering. It is basically strong local tea (my favorite) that has been mixed with sweet condensed milk and “pulled” until it is frothy and slightly cool enough to be sipped – the tea version of cappuccino. It is an incredible sight to watch someone pouring the steamy tea into another container while “pulling” the tea by lifting the containers away from each other, without spilling a single drop. Just like its coffee counterpart, the top foam makes this drink stand out from its flat version. This is usually drunk at anytime, including late in the night at the night markets. 6) Duku Langsat – the flesh is sweet and fleshy with a bitter tiny seed in the middle, making it a challenge to eat the fruit without biting it. But the sweet flesh makes it worthwhile and all attempts are usually made to avoid the center. The outer skin is quite distinct by its leathery quality that peels easily to reveal the semi-translucent flesh. 7) Chiku – This fruit is also known as Sapote in the Spanish-speaking world. The sweet flesh is very soft but a bit rough in texture. Like most fruits in this part of the world, it is seasonal and thus available only at a certain time of the year. I was glad that it was available when I made my visit back recently. 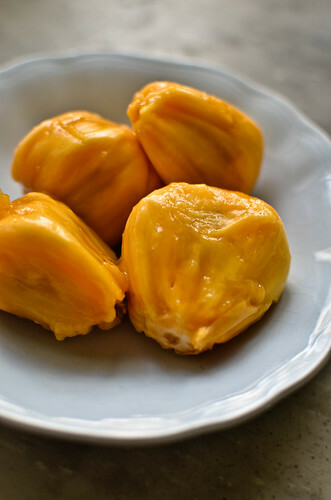 8) Chempedak – this fruit is related to the Jackfruit and Breadfruit, but it grows only in the Southeast Asian region. The flesh is a rich and sweet soft flesh, much like the texture of a ripe mango, but much sweeter and strong heady notes to accompany it. The seeds are usually saved and boiled, tasting much like a richer water chestnut. 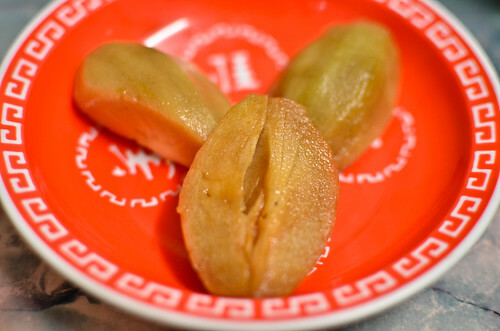 As a child, I would eat this fruit that has been battered and deep-fried, which made the seeds edible when well-cooked. It is definitely missed due to its unavailability outside Southeast Asia. 9) Starfruit – most homes in this tropical country would grow this fruit tree since they do well without much care. When in season, the tree bears many fruits that need to be wrapped in paper to prevent the birds from ingesting them, as was in the case at my auntie’s home. the skin is a a thin skin that protects a juicy insides, much like a soft apple. However, it is slightly tart and sweet at the same time, providing a light crunch in each bite. Strangely, Malaysians love to eat it by dipping it into a pool of salt. 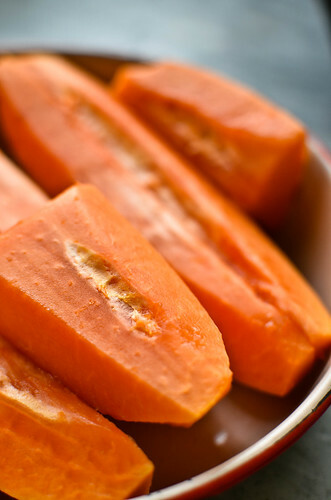 10) Papaya – another commonly grown fruit tree in most homes is the papaya. Like the starfruit, it is commonly vulnerable to birds that sense when the fruits are ripe and sweet, thus the common practice of wrapping them in paper as they ripen. I really enjoy this soft and sweet fruit that exude a unique fructose flavor that is unmatchable. 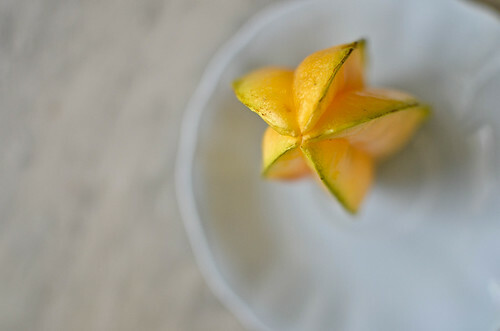 It is one of my favorite breakfast fruits that is paired with a squeeze of lime. 11) Mata Kuching – A long time favorite of mine. It is a slightly leathery flesh that is very sweet, coating a hard black seed. It bears the name of “cat’s eye” due to its similar appearance. This fruit is very sweet and makes it completely irresistible, making heavy consumption of it possible. However, the common warning is that consuming too much can over-tax the system. 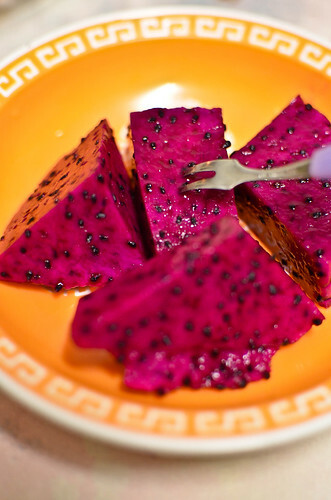 12) Dragon Fruit – this fruit was not common more than 10 years ago. 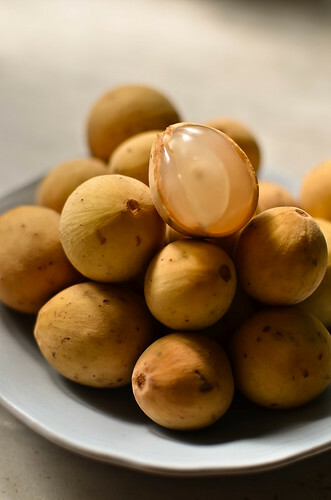 This fruit is indigenous to Vietnam and it made its way to this part of the world. It bears such name due to the leaves that emanate from the body of the fruit, looking like dragon scales. But inside bears a richly colored fruit that is soft and sweet. It has become a well sought-after fruit by the locals due to its wonderful flavor and exotic looks. 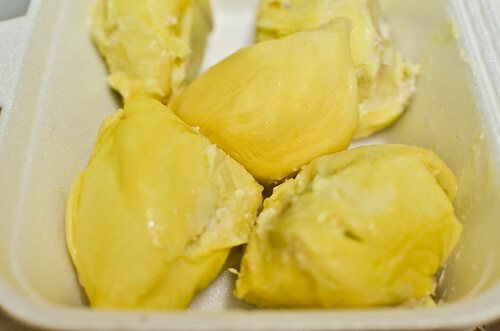 13) Durian – I saved the King of Southeast Asian Fruits for last among the fruits. How can I explain its flavor? It is unique and extremely strong, yet illusive at the same time. Some have described it as rotting garbage which does not make it exactly attractive to the novice. But once you can get pass its strong odors, you will taste a flavor that is rich, custard-like, very heady, complex, slightly fermented, sweet, and mineral-like. It is this mix of flavors that make it totally irresistible to many, much like an addict looking for a fix. I have watched many locals sitting at stalls indulging in these fruits with glazed eyes – and I know why. 14) Tau Foo Fah – One of my pleasures of going back to my childhood home is going to the morning market like I used to do so with my grandmother and later with my mother. It was always a delight to see fresh ingredients among the array of spices and dry goods. Among them are prepared foods that are readily available for consumption, including this Tofu dish which I came across a vendor selling this item. 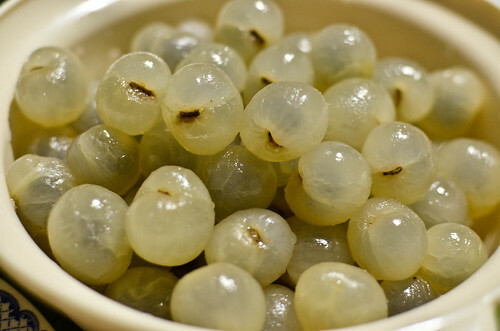 Although it is a sweet dish, it is usually eaten as a snack or at any time of the day. It is fresh soft silken tofu that is paired up with palm sugar spiked with fresh ginger. This is indeed a healthy snack and has a cooling effect on the body even when consumed hot, as it is customarily done so. 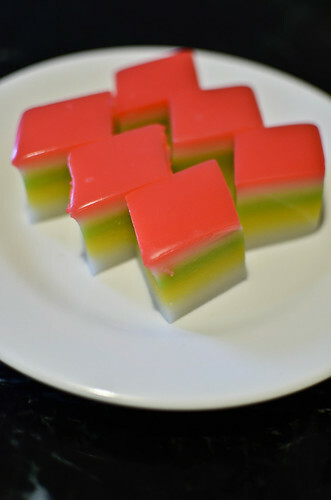 15) Kueh Lapis – While visiting my parents in Melbourne, Australia, we stumbled across these Nyonya cakes in a local Asian grocery store that caters to the local Malaysian community. They are made of layers of rice flour dough that has been enriched with coconut milk, each layer steamed separately thus its name meaning “layer cake”. Each layer is contrasted with a different colored layer to create such effect. Eating this delight reminded me of my grandmother who was a master Nyonya cake maker, and I was glad to be the recipient of her wonderful gift. They are usually eaten for afternoon tea rather than dessert after a meal. 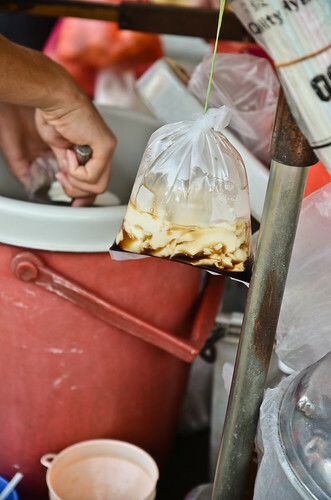 16) Ais Batu Campur (ABC) – This dessert/snack is a definite favorite among nearly all Malaysians. It is basically shaved ice that is sitting on top of a melange of cooked red beans, cooked fresh corn kernels, different forms of jelly, and nuts. 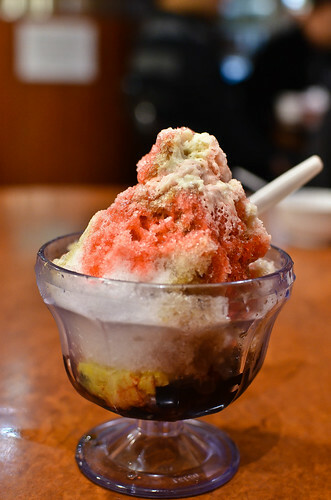 The shaved ice is usually flavored with a sugar syrup, rose petal syrup and evaporated milk. As a child, this was a frequent order during my school recess time as a way to cool down from the heat and the non air-conditioned classrooms. I had this rendition with my parents and their friends in a Malaysian restaurant in Melbourne, even in the midst of their winter season. I guess, for some, habits are hard to die as we were digging into it with gusto even after a big meal, much like little kids at the school canteen, albeit in cold weather. This ends the series of Malaysian food, from Noodles and Rice Dishes; Breakfast, Lunch, and Dinner 1; and Breakfast, Lunch and Dinner 2. I hope the series has shown you the essence of this Southeas Asian cuisine, the variety of dishes, and that it has inspired the reader to look out for the dishes that I have described, even though some dishes seem a bit off-putting by the descriptions, like the Durian fruit or the Buah Keluak. But one has to take the leap and take the first bite. That may just change your mind and make you an aficionado of the rather bizarre. If not, there are many more dishes you will fall in love with. Selamat makan (Happy eating). I wish I could try all these exotic fruits…I love Durian and would take the leap to try any one of these! I wish they are more readily available in the US, but I’m sure you can find some of these in the Asian stores on the West Coast. 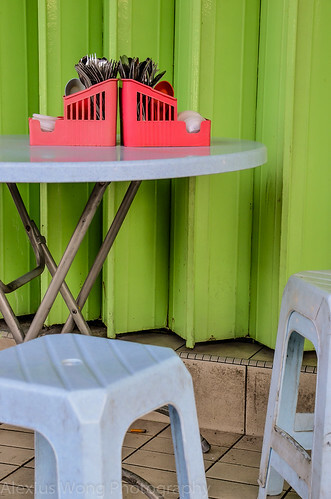 This blog is making me homesick! What gorgeous pictures. Looking forwarding to reading more of your culinary travels. Terima Kasih. Yes, I get homesick too, that’s I write about it. Hello, I thijnk your blog might be having broeser compatibility issues. Thanks. I know it is hard to find a format suitable for everyone’s screen. I will stick to Explorer. Thanks for the comment.